Is it hot? Is it cold? Is it wet? Is it dry? Weather is the way that air and the water in air change in a location. Weather is different in different places. 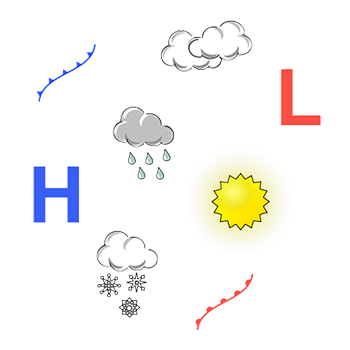 Weather occurs in the troposphere, which is the layer of the atmosphere closest to Earth. The troposphere is approximately 65-75 miles high. Earth’s gravity keeps this layer from expanding further. Farmers used to watch the skies for signs of rain and changes in weather. Winds move conditions and tell us both direction and whether to expect warmer or cooler temperatures. Water vapor in the air is called humidity. The more water there is in the air, the more humid it is. Humans are most comfortable in a humidity range of 30-70%. Under 30%, our face, hair skin and eventually nose, throat, and lips become dry. Over 70%, most people feel sticky and will begin to sweat. The study of weather is called meteorology. Today, weather reporters or meteorologists watch radar images from satellites to predict weather forecasts. Scientists also study, observe, predict, and explain the weather. You can be a weather watcher too! 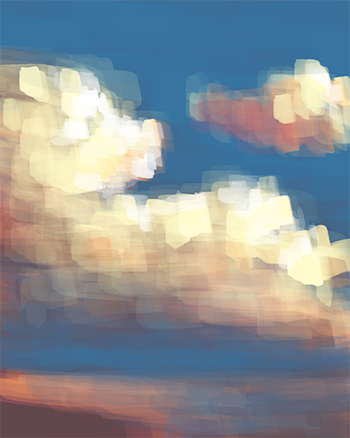 What do you think we can tell by looking at the sky? You can usually tell the time of day even without wearing a watch by the location of the sun. Do you see any clouds? Can you feel the air move? Breezes and the wind push the clouds carrying moisture and bring rain when full enough. We can tell whether it is sunny or overcast. We see which way the wind is moving. We observe if something is falling from the skies. We predict what weather will come next. 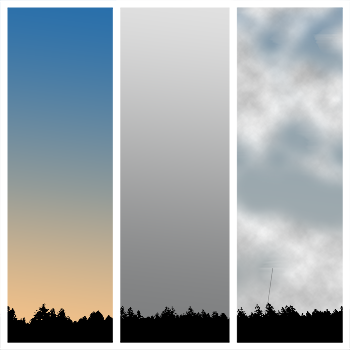 Draw or take photos of three different skies and label what weather they predict. Weather maps use weather symbols. Take a look at the weather map in your local newspaper or watch the weather on the news. 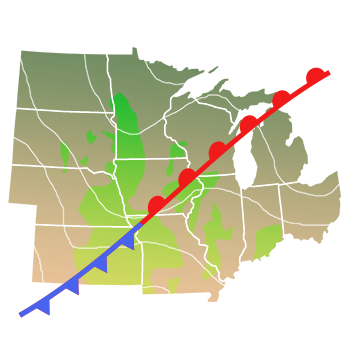 Try this interactive weather map and note the different symbols of fronts, warm and cooler air. Look for symbols for sunny, partly cloudy, overcast, stormy. Draw weather symbols and label them. Scientists and meteorologists collect weather data and look for changes in temperature, humidity, wind, pressure, and precipitation. This week you will be a citizen scientist and collect weather data regarding numbers and percentages and probabilities. 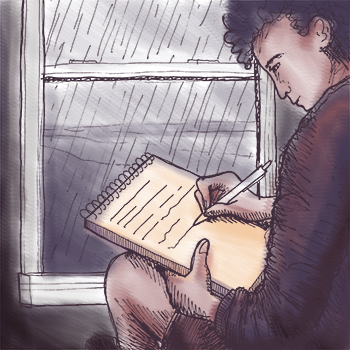 Reading the paper or checking online, record the temperature range, sunshine or cloud cover, the amount or possibility of precipitation, the rate of humidity, strength, and direction of the wind. Record the weather for seven days in a row making a chart of data. Today we have access to radar maps of weather. These maps show current and future passage of clouds, temperature change, and precipitation. We can look at these maps and decide what to wear and whether to carry an umbrella or a warmer coat. Using a Doppler radar map of your town, make a weather map for today. Mark the temperature. Record temperature change as in a cold front, warm front or stationary front in which the temperatures stays relatively uniform. Severe weather is when wind, rain, temperature, and snow, are extreme. These conditions raise the possibility of damage to human property and life. 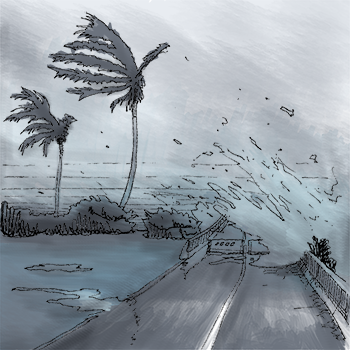 Thunderstorms, lightning, tornados, flash floods, high winds, hail, excessive precipitation, and wildfires are examples of life-threatening severe weather, as are downbursts, waterspouts, tropical cyclones, and extratropical cyclones. Regional and seasonal severe weather phenomena include blizzards, snowstorms, ice storms, and dust storms and more. Choose one storm type for each season—summer, fall, winter and spring, and research precautions people should take to stay safe. Are you ready to set up a weather station? 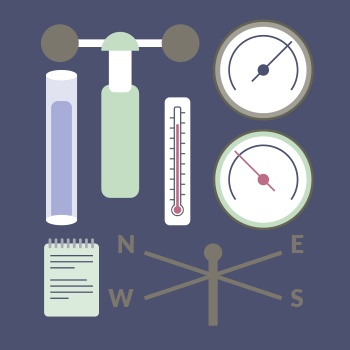 You will need seven main pieces of equipment: An anemometer, a hygrometer, a precipitation gauge, a thermometer, a barometer, a weather vane and a weather journal. A hygrometer measures the percentage of water, or dew point, of the humidity in the air. A precipitation gauge measures rain and snow. You can set a container that has measuring lines on it. An anemometer measures the wind speed. While the wind blows at many speeds, 5 miles per hour or less is considered comfortable. Look at a wind chart to learn different names and dangers for speeds of wind. A thermometer (digital or analog) is used to measure the temperature of the air throughout the day. Key points to remember are 32 degrees Fahrenheit is freezing, or when rain will turn to ice and snow. A barometer measures air pressures. If the air pressure is high, clear skies are ahead! If the air pressure drops, rain or snow will probably follow. Record weather data in your weather journal. Does your school have a weather station? If not, it could! Draw and label the seven parts of a weather station and what each piece measures. Thunder is the sound that follows a lightning strike. Lightning produces vast amounts of energy, which heats the surrounding air very quickly. This rapid change in temperature causes the air around a lightning strike to expand rapidly and form fast-moving waves. The result is a loud booming sound which we know as thunder. Because light moves at a much faster rate than sound (186,000 miles per second vs. 767 miles per hour), we see a lightning strike before we hear it. To find out how far away lightning is to your location during a storm, count the seconds between seeing a lightning strike and hearing it. A five-second delay means it is about one mile away. 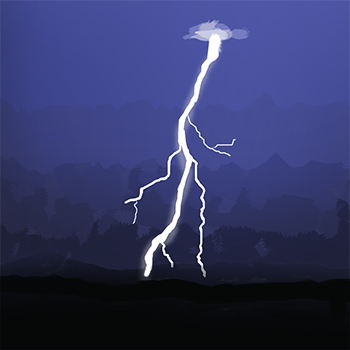 Try your hand at simulating thunder! All you need is a brown paper lunch bag. Blow into the bag to fill it up with air, then twist the end and clench your hand to close it. Hit the sack with your other hand and see what happens. The impact will compress the bag, forcing the air to expand and break the container. Which weather station tool measures wind direction? People are comfortable when the wind blows 50 miles per hour.